We all know when it happens, that magical moment when you watch a film, a stageplay or television, or read a book, and something happens that takes hold of you emotionally and completely holds you in its power for its duration – this could be one scene, or in the case of a series, a culmination of spellbinding scenes that totally control you emotionally and personally. This moment doesn’t happen by accident, it is a moment skilfully created and crafted by the writer. What makes a perfect scene, an ideal scenario that draws you into its magical realm? Firstly, the greatest mistake most writers make is to pigeonhole a scene and call it a scene, thereby left-braining it and restricting it to logic and reason. A scene is an event out of character’s life that can evolve into a sequence of events and become whatever the writer wants it to be, and never a dull, lifeless moment of nothingness. Story Events (scenes) are meaningful, not trivial. To make change meaningful it must, to begin with, happen to a character. Event choices cannot be displayed randomly or indifferently; they must be composed, and to ‘’compose’’ in a story means the same thing as it does in music. To express your feelings, but it becomes self-indulgent if it doesn’t result in arousing emotions in the audience. To express ideas, but this risks solipsism if the audience cannot follow. To make change meaningful you must express it, and the audience must react to it, in terms of value. 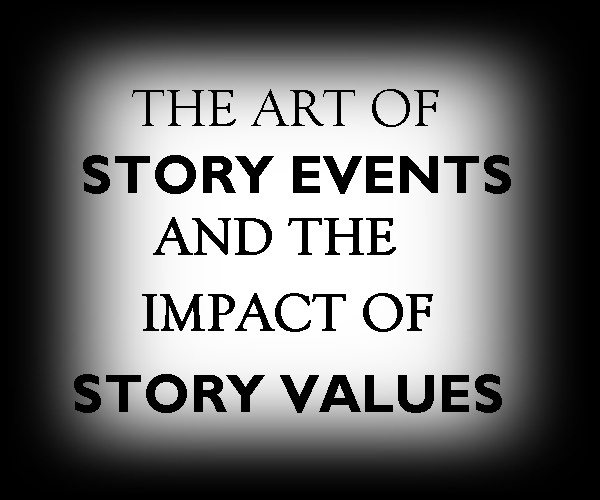 ‘’Story Values refers to the broadest sense of an idea. Values are the soul of storytelling. Ultimately our is the art of expressing to the world a perception of values. For a typical film, the screenwriter will choose forty to sixty Story Events. A novelist may want more than sixty, a playwright rarely as many as forty. So, how do you write the perfect scene? Now get yourself a stack of index cards and use an index card for each event. On the front of the card you will plot your story and each Story Event, and on the back of the card you will look at your characters in each Story Event. Although this process of constructing Story Events might seem complicated, it’s an incredibly simplistic and instinctive; a stimulating and inspirational; creative process that empowers writers to fully own their stories, what happens in the story, how the story happens, who the story happens to, and its meaningful and rewarding thematic purpose. Just think of Story Events in films, theatre, television and books that have touched you deeply, personally and emotionally, and on closer inspection, you will see how skilfully the writer has crafted the story to give its audience and readers a ‘perfect’ and life changing experience that will last a lifetime. TIP: The Card Outline is an organic process and works best if you are using a pencil. It is a creative, right-brain activity that fosters constant change; if one thing changes, it affects everything else. It is also a process that allows you to strengthen your story by exploring the inner life of your story. Story Outlines and Card Outlines form part of The Write Journey course. Copyright © 2016 Daniel Dercksen, the driving force and creator of the successful independent training initiative The Writing Studio, has been a published film and theatre journalist for 30 years, and published screenwriter and playwright, has been teaching courses in creative writing, play writing and screenwriting internationally the past 19 years.